It was two years ago that I opened my email from my iPad late one night and got some of the most exciting news! Let me tell you how it started and then stay for a BLOG HOP at the end of this post. I had been on design teams for sketch sites, kit clubs and challenge sites and I was ready to take the leap to a manufacturer when I saw a call for Imaginisce. 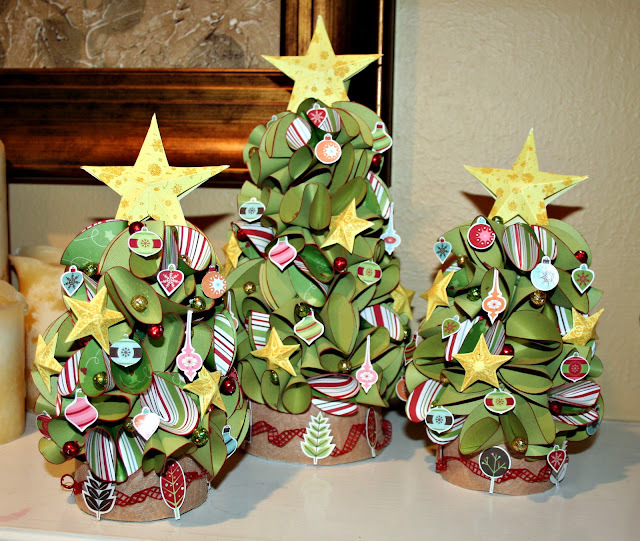 I bought bits and pieces of their Christmas and birthday lines and went to work creating these Christmas trees & photo tutorial, which even today, are one of my most visited posts from this blog. Perhaps it's the trees themselves or maybe it's the photo tutorial but these babies get a lot of attention. I also made a birthday layout and a Christmas card and sent my application in to Imaginisce in response to their open design team call. Apparently these got the attention of Imaginisce too because I was invited to join the 2011 team and eventually the 2012 team too! My 2nd term is ending in just a few days and I am still soo thankful to Lori Allred for originally inviting me to join the team and becoming such a fun friend to hang with here, there and everywhere. Also to Bridget because she's just cool and we repin each other all the time on Pinterest, plus when we hang out we always have fun. And of course Cari for asking me back for a 2nd term and being so supportive, especially during my job-related stress period this year, and Don for always making me feel awesome! I made such wonderful friends on both of these teams. I will miss you all but I will keep an eye on your artistry. You will see a little bit of me in 2013 with Imaginisce though - I designed some layouts and an alterable using their CHA Winter 2013 collections. I'll be sure to share them here on my blog. Veteran's Day "Hero" Card Monkeying Around Necklace & Bracelet Made by Me! I wish the ladies of the 2013 design team the best of luck and thanks to Imaginisce for giving me my big break! Make sure to leave a comment on my blog (and become my newest follower if you like what you see). Your next stop is the last stop - the Imaginisce blog. Make sure to complete the entire hop for a chance to win a Love you More collection pack (full details on the Imaginisce blog)!